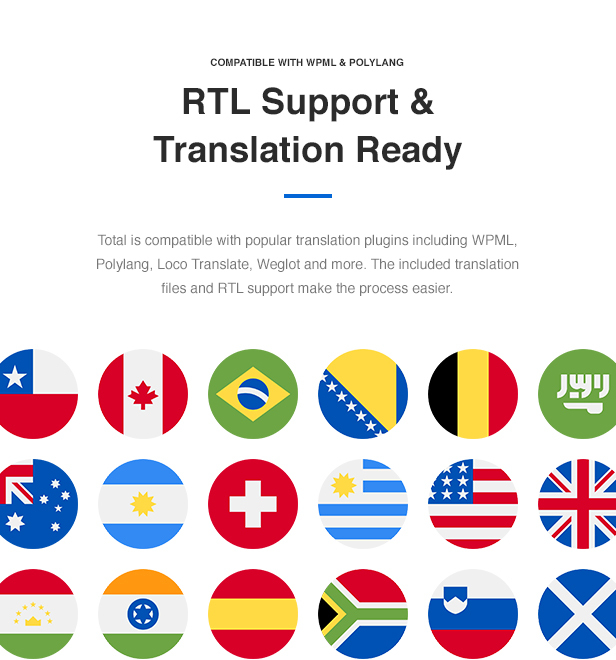 3rd Party Compatibility: The Total premium theme has been tested with tons of popular 3rd party plugins and even includes custom code as needed for full compatibility. 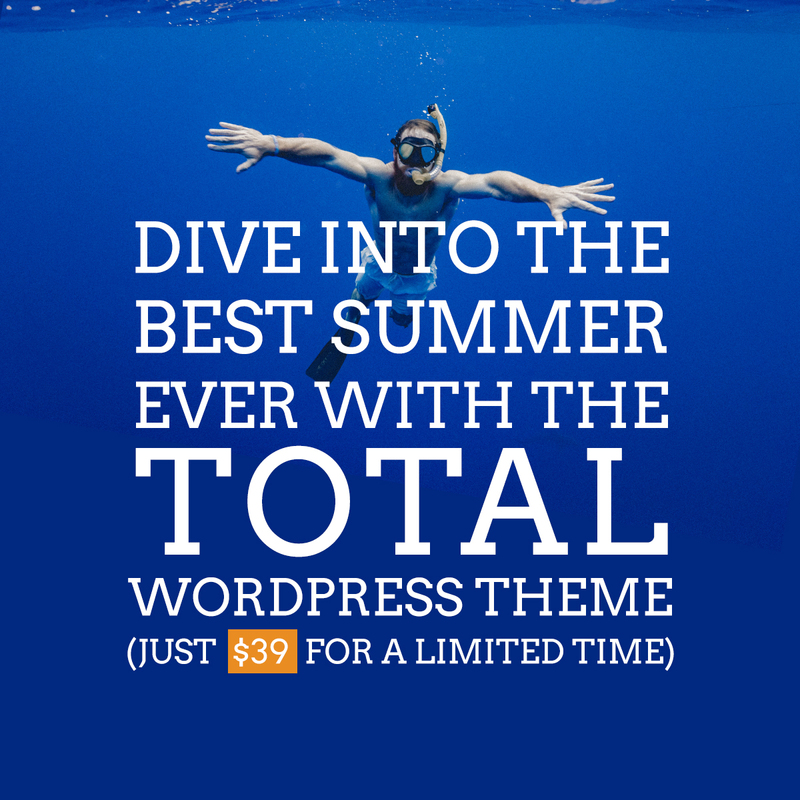 Some of these plugins include, but aren’t limited to: bbPress (forums), WooCommerce (online store), WordPress SEO by Yoast, The Events Calendar (also known as Tribe Events), WPML, Polylang, JetPack, Slider Revolution (included free), LayerSlider (included free), Visual Composer (included Free)…and many more! Base Full Theme Demo: This is a full example of all the wonderful things that Total can do. 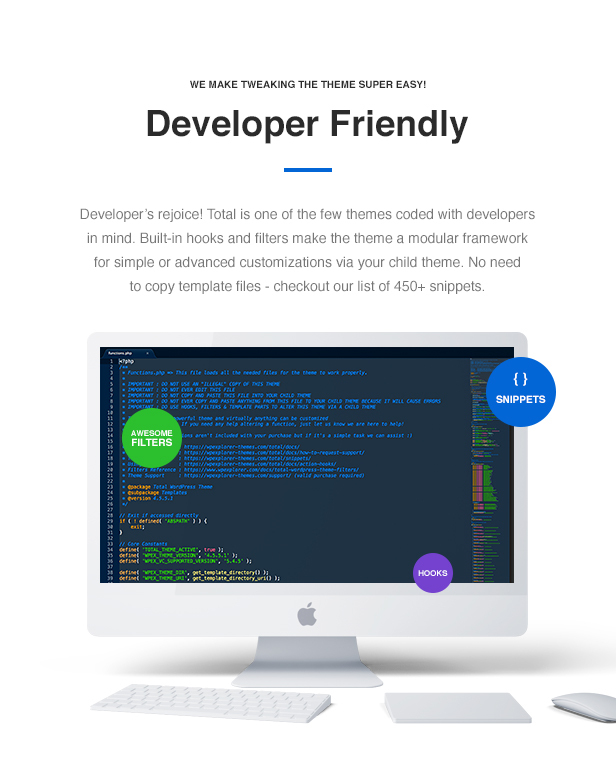 With over 30 homepages, tons of portfolio layouts, example services pages, various blog formats, staff pages, testimonials and more Base covers most of the core features you’ll find in the Total theme. Samus Modern Business: This demo highlights how you can use Total for your business or agency. With a custom homepage, services section, portfolio or work, team, pricing page, blog and even a contact form this demo has everything you’d need for a beautiful website. Plus Samus makes use of Total’s Font Awesome integration, custom color options, page layout and unique page builder elements to really stand out. Nouveau Professional Portfolio Photography: Nouveau is perfect for freelancers, photographers and small businesses. With a minimal homepage, simple portfolio and straightforward pages for services and staff this theme is a readymade template for many different professions. Boost Minimal Marketing Agency: Sell your services or products with this beautiful layout. Add a features page, a showcase of your appearances in the press, real life client reviews and more with this impressive fresh and bold theme design. Adapt Creative Web Design Portfolio: Get more clients with an awesome website. The Adapt Total theme demo makes use of the built-in portfolio custom post type, icon boxes, gallery sliders, tours and compatibility with the popular Contact Form 7 plugin to create a one of a kind website design. 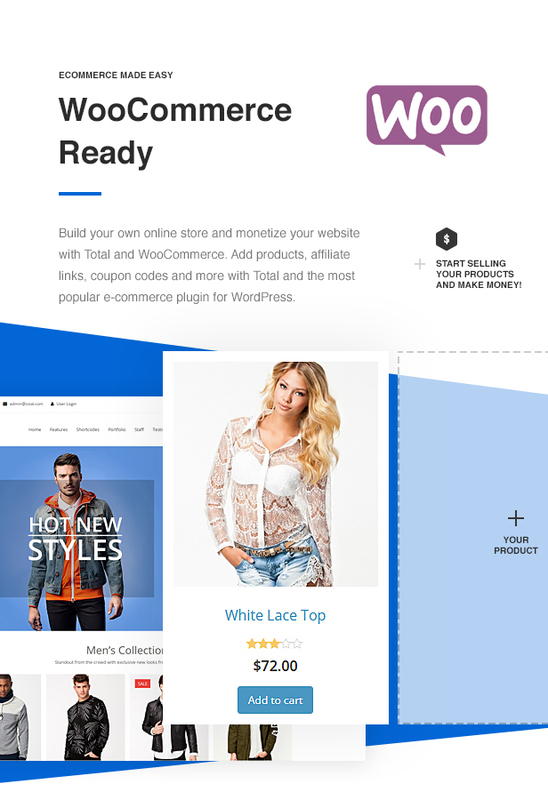 Agent Business Solution: Build a website for your business, display your pricing and packages, show off your work and even sell your own supporting products or services with the full WooCommerce e-commerce support included in the theme. The Total Agent demo is a great start for any growing business. Corporate Business WordPress Demo: Corporate is a responsive business website demo. This professional Total demo is great for corporate head hunters, strategists, SEO experts, acquisition companies, business consultants and more. Using the pre-built page layout for about, pricing and more you can start finding clients asap. 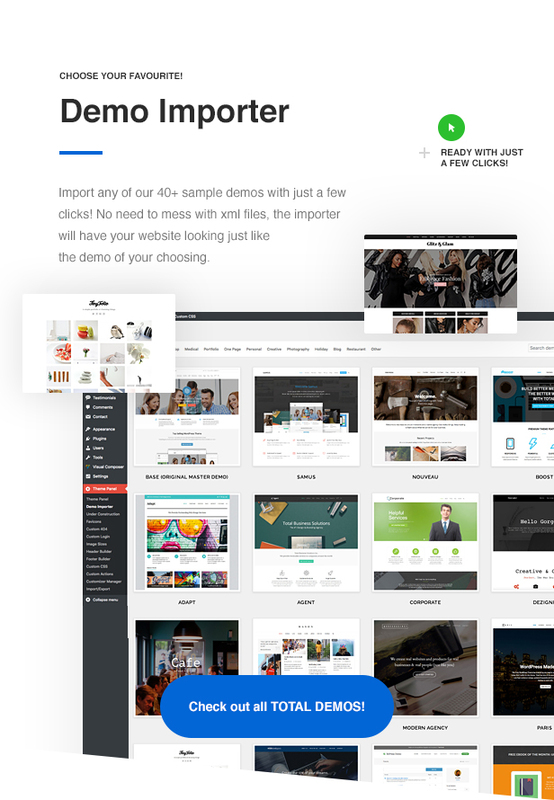 Dezignr Bold Single Page Web Design: Dezignr is a single page website design with local scroll created specifically with freelancers and creative professionals in mind. This primary black and white one page design features pops of red to help keywords and important sections standout (like newsletter signup). Cafe Delicious One Page Restaurant Demo: Cafe is a single page food demo that uses Revolution Slider to make a bold statement with a fullscreen slider at the top of the page. This full-width page layout includes sections for about, menu, food gallery and even Yelp. It’s a quick and delicious way to build a website for your cafe, deli, popup restaurant or even food truck. Mason Minimal Masonry Grid Blog: This demo is a clean masonry grid blog. Perfect for bloggers in every niche, the infinite scroll layout is perfect for showcasing fashion, trends, reviews, galleries, quotes, videos, sound bytes and more. Modern Agency Web Design Demo: The Total Modern Agency portfolio demo shows how web design firms and agencies can showcase their work and their business online. Lots of white space helps images pop on portfolio pages, and the unique contact page is perfect for capturing leads. 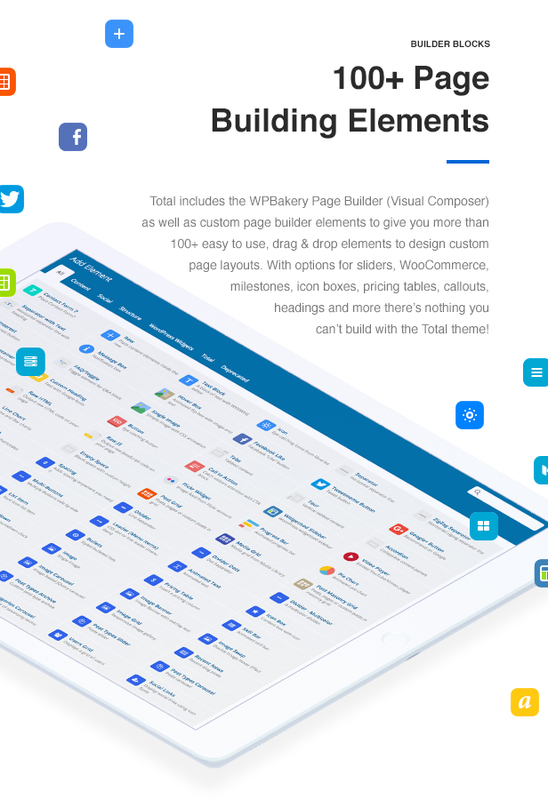 Paris Web Development Landing Page: Build a beautiful one page website with local scroll for your business with the Paris template. This demo uses parallax backgrounds, pricing tables, milestone animated counters, customer testimonials, logo showcase and more. It’s a perfectly professional way to show your clientele what your business is all about. Tinyfolio Minimal Personal Portfolio: Show off your day to day creations with an online portfolio. The Tinyfolio demo is a clean and simple portfolio grid layout with a bright white background that’s perfect to display your photographs or even videos. Webdevelopers Simple Agency: Build a clean and simple website for your web design or web development agency with our Webdevelopers demo. The clean homepage features sections for about, services and a testimonials carousel. Plus the blog has been fully styled to match. bbPress Forum: Unlike many other themes Total does’t just support bbPress. it also includes styling for this popular forum plugin. Build your own online community or allow customers to ask questions and receive support with bbPress. eBook Flat Single Page: This bright and flat one page design is an easy way to promote your ebook or other digital good. Add links to purchase your product, include your social links and even add a video to help promote your creation. SEO Blog and Modern Optimization Service: Find customers for your services with the SEO Total demo. 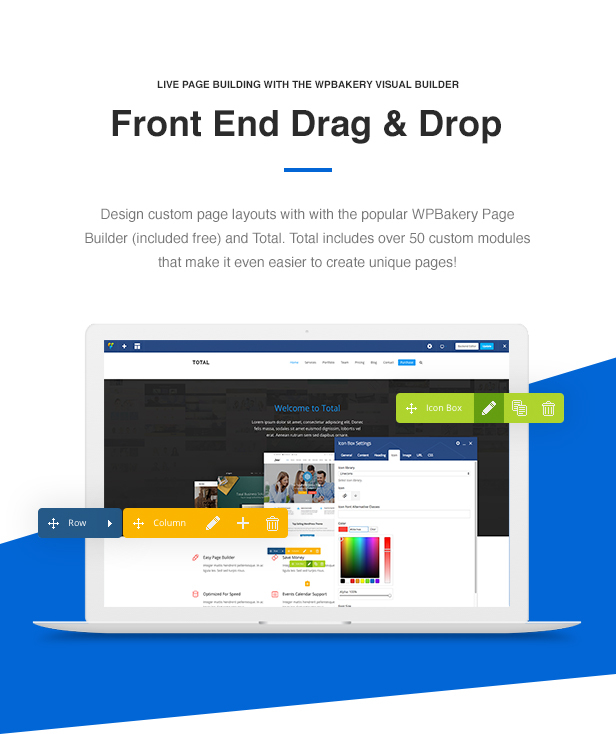 This modern multi-page website design was created with the included page builder. With page sections added for pricing tables, service icon boxes, staff grid with social icons, alternating case studies and of course a full blog yo can build an impressive website to impress clients. James Personal Boxed Portfolio: One of the best ways to showcase your design skills is with a website. Our James demo is a great example of how you can create a boxed layout personal portfolio with a stunning homepage and a blog using the Total theme. Adding your skills and recent work couldn’t be easier. Boxed Folio Elegant Portfolio: If you love boxed layouts than you’ll love Boxed Folio for your own personal or professional portfolio. Using Slider Revolution to add a video slider to your homepage, and included the page builder elements like image carousel or grid to, you too can build a beautiful portfolio for your work. 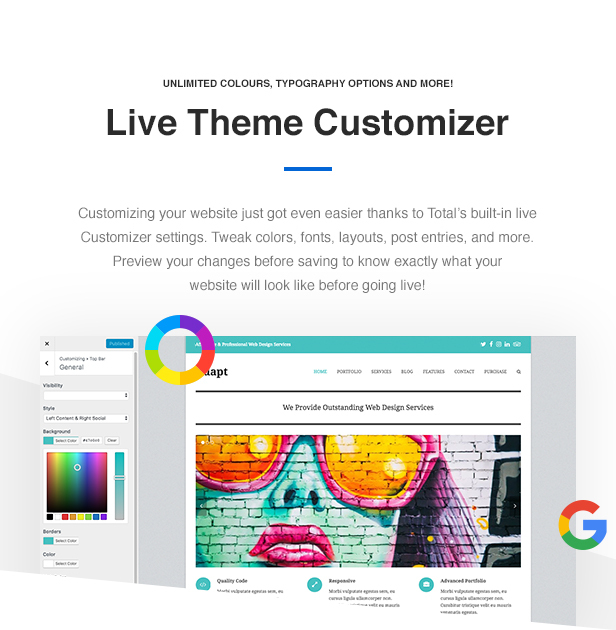 Cleaner Traditional Business: Create a professional and traditional website for your business with Total using our Cleaner demo. This demo features a clean homepage layout with features, a welcome video, and callout to create a layout you’re comfortable with. Plus added pages for services, portfolio, blog and contact ensure you’re customer can find all the info you need. Graphix Single Page Resume CSV: When applying for jobs or internships you need a good resume, but even better than one on paper is one online. Leave interviewers with a way to review your qualifications after you leave using the Total Graphic resume and CSV demo. Add skill bars, education and work history, your portfolio, a downloadable copy of your resume and even add a way to contact you all on this single page layout. Landscaping and Gardening Layout: Increase business for your small business with a website. One of the best ways to spread the word about your offerings and services with a website the properly displays them. The Total Landscaping demo uses built-in theme features for services, testimonials, social links, custom menus and more to create a pixel perfect web design. Sustainable Nonprofit Eco Events demo: Total is compatible with the free Events Calendar and premium Events Calendar Pro, which is exactly what the Sustainable demo uses to display its calendar of events. This along with a custom build homepage, about page and blog make Sustainable an excellent option for any charity, nonprofit or fundraising website. Charlotte Minimal & Cute Blog Magazine: With Total you can build anything – even a blog magazine. Use the builder to add a featured posts slider and recent posts grid to your homepage, then add an about or contact page to complete your website. Classy Impressive Corporate Business Design: Classy is an old school boxed business style layout that is perfect for adding all your business info online. Using Total’s options for a customizable animated slider, callouts, icon boxes, portfolio, staff, pricing tables and more Classy offers a practical website design for any organization. Construct Constructions and Architecture: Construction is a competitive field which is why it’s so important to have a website to showcase your previous work, available services and of course a way to contact you for a quote. All of this and more can be found in the Total Construct demo which provides a great base to quite literally construct your perfect service based website. Freelancer One Page Web Design: Freelancer offers a single page web design with local scroll and full width sections that make an impact. Add promo videos, services, social links (or on this case, a link to a Dribbble portfolio), testimonials slider and of course a very practical contact form using Contact Form 7. Simple Spaces Elegant Interior Design: The Simple Spaces demo is a great way to showcase your design skills. Build your about page, share a galleries of your completed projects, add in real customer reviews, display your mentions in the press and add a journal with thoughts or styling tips. Lefty Left Navigation Artistic Portfolio: Artists are creators, and creating a website to promote yourself is just as important as your work. The Lefty design is a minimal way to display your creative works from the real world, as well as to provide investors or clients with a way to find you on social media or via email. Healthcare Health Insurance or Hospital: Build a website for your healthcare, insurance, urgent care, pharmacy, birthing center, nutrition, clinic, hospital, hospice, physical therapy, counseling center or other business in the health industry. 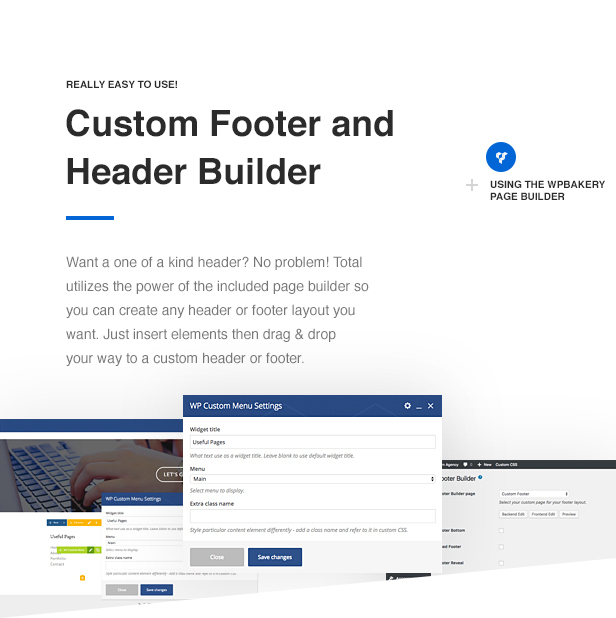 Build almost anything with Total’s custom Visual Composer page builder elements, WooCommerce commerce shop integration, and fully customizable design. Appy Apple or Google Play App Splash Page: Building an app is hard work, which is why creating your app website should be easy. Build a website to link to your Apple App Store or Google Play Store app – like this simple page promo app splash page we created with Total’s options for images, videos, buttons, and callouts. Blog Nom Food Blogger: Share your passion for food with a food blog. Blog nom is a bright and minimal design for any foodie that uses Total’s advanced blog options for image posts, recipes, video blogs, galleries and more! Zoo Ecology and Zoological Business: If you love bright pops of color, bold layouts, and creative use of images then the Zoo demo is full of unique ideas that are right up your alley. This design is perfect for a zoo, petting zoo, animal rescue or education facility, carnival, skate park or even a trampoline park. Flat and Minimal Business Site: The Flat Total demo is perfect for any business or agency to create their website. Build a custom slider, add your latest work to your porfolio and create custom about or service pages. Plus, since Total is fully WooCommerce compatible you sell your own products and services right from your own WordPress website. Law Firm Legal Professional: Law, accounting and legal firms need professional websites and the Total Law Firm demo is just that. This demo utilizes Total’s many options for milestones, features boxes, staff pages and grids, a blog (to share legal tips and news) plus unlimited color options to create a website that puts your firm’s best foot forward. Married Single Page Wedding Design: Your wedding is an important day which is why you should build your own wedding website instead of using a free one. Married is an excellent way to share your big day with friends and family. The demo features a local scroll with full screen sections for the proposal story, save the date, events schedule, accommodations, engagement photo gallery, registry and an RSVP form. Awareness Charity Nonprofit Website: The Awareness single page breast cancer fundraiser demo is an example of how you can build a landing page for your cause. Add information for your event, how people can get involved and of course important links to sponsors, social media and related sites. Vlogger Video Blogger Vlog: Build a blog to go with your YouTube website. This is a great way to offer exclusive content to your followers. Share your latest vlogs, create blog posts about your life or even monetize and sell your own swag (like t-shorts, pop sockets or phone cases) right from your own website with WooCommerce. Dentistry – Doctor, Dentist and Medial Professional Site: The Total Dentistry website design is a perfect start for your own dentistry, private practice, OBGYN, pediatric or other medical type website. Add information about your procedures or services, build a page for new patient forms, share staff bios, and even include an appointment scheduler with a plugin. Paddy’s St Patricks Day Event Post Landing Page: Create a flyer or splash page for your upcoming St Patrick’s event with the Paddy’s Total demo. Add your event details and make it easy for your patrons to share the event with their friends on social media. Cinco de Mayo Event Splash Page: Build a bold landing page for your event with the Cinco demo. This food and restaurant themed demo includes full screen sections for event date, specials, menu, and a contact form. Use Total’s extensive color and font options to really make the demo your own! And there are lots more demos to come! But you can view all the theme demos and learn more at TotalWPTheme.com.